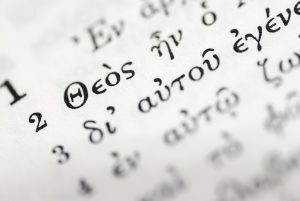 Greek New Testament | Dr. Justin Imel, Sr.
God inspired the New Testament in Greek; therefore, the one wishing the fullest understanding of Scripture will turn to the Greek New Testament. This wide-margin copy of the Textus Receptus allows you to plunge into the underlying text of the King James Version and New King James Version of holy writ. While modern research has greatly enhanced the Greek text from the days the Textus Receptus was widely used, this volume can be helpful as you explore the text of two of the most-loved English translations and as you explore textual changes through the years. This entry was posted in Bible, books. Bookmark the permalink.